The node red dashboard is an add-on module that lets you create live dashboards. It is an optional module and not installed by default. Here are the install instructions and a brief description of what it does. On Linux you need to have created the link to node or the install fails. You get a series of warnings at the end as shown below: The warnings are nothing to worry about. 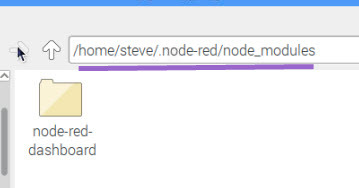 You need to go to the ~/.node-red folder (Linux) to do the install otherwise when you open the node-red interface the dashboard icons will be missing. 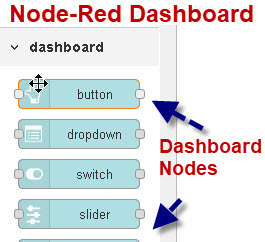 The Node_red dashboard files are stored in a folder called node-red-dashboard in the node_modules folder. The install adds a new category to the node palette and a collection of UI (User Interface) nodes. They consist of both input and output nodes. To use them just drag them onto the flow canvas. The dashboard or display nodes appear on the User Interface (UI) dashboard. You can have multiple display pages called tabs and each tab has a name. 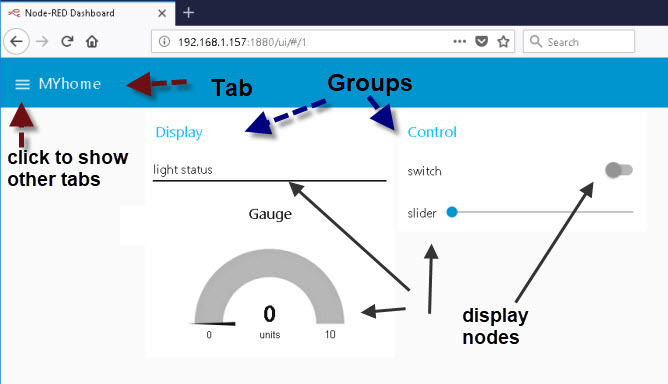 On a Page the display nodes can be arranged in Groups. When you drag a node onto the flow canvas you will need to edit it to target a display tab and a display group. 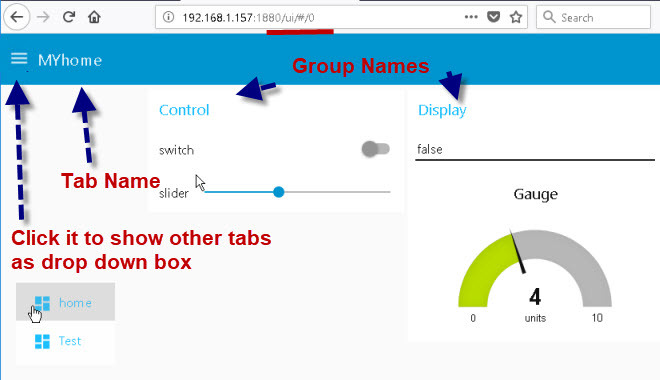 The Group Name – group and tab example shows a group called control on the MYhome tab. Name – This is the name in the flow workspace. The layout of the UI screen can be controlled in the dashboard tab (third column main screen) of the admin page and select layout. 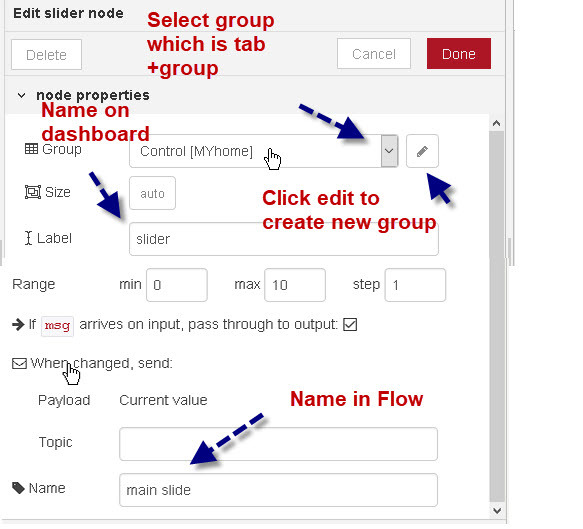 You can create new tabs and groups and move display nodes between groups using this screen. This is usually were you do the initial design. The screen shot above shows a flow with three display tabs called MYhome and Bedroom and Lounge. 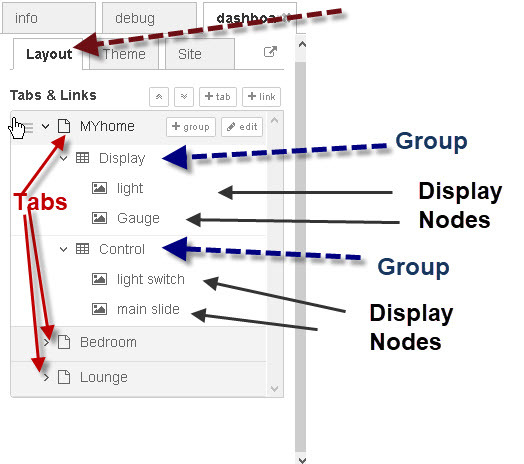 The MYhome tab has two display groups call display and control. The display group has two display nodes guage and light and the control group has two display nodes -light switch and main slide. This is how they appear on the User Interface. This is the Flow I used to create the above. This video takes you through installing and creating a basic dashboard. Thank you so much for all the work you do in building and continuing to expand your website of information. You present the information in a logical, easy to understand method. Because of that, when you have covered something I’m interested in learning, your site is the first I start with. From your pages I’ve learned enough about Node-Red and MQTT to let me begin to control the tasmota’d sonoff devices. 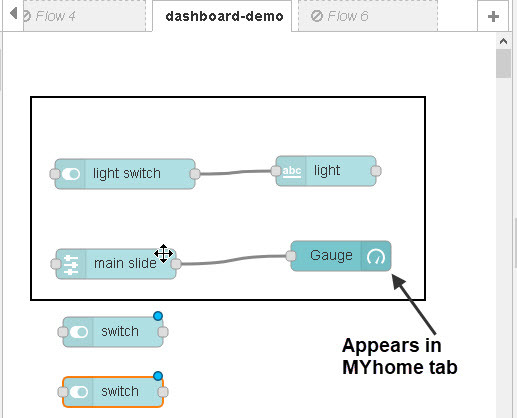 Have you dabbled with the programs openHab or HomeAssistant? Tks for the nice comment and glad you find the site helpful. I have dabbled with homeassistant and it is on my list of things to do.